Learn how to run a smooth build and get your ideal facility on your budget. 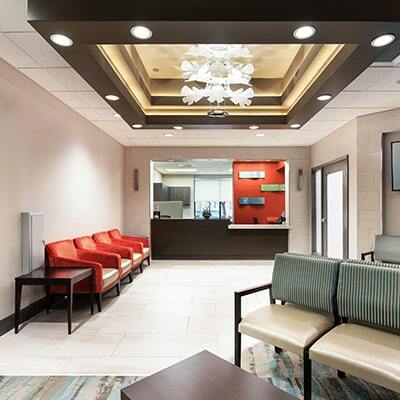 At The Korte Company, we’ve delivered quality healthcare construction for decades. In fact, the first Design-Build project we ever completed was a long-term healthcare facility in our hometown of Highland, Illinois. Building healing spaces is something we’ve been doing since practically day one, and we’re proud to be known today as a national leader in healthcare Design-Build. Through the years, we’ve seen healthcare design and construction evolve as technological developments, medical breakthroughs and regulatory environments have impacted our nation’s facilities. Today, care providers are transitioning from a volume-based care model to a value-based care model — one that requires healthcare design and construction to support patient outcomes and population health management. As a result of this shift, the philosophy behind private-sector healthcare construction has changed. The goal of healthcare facilities is no longer to stay at maximum occupancy and reach maximum acuity. Small and medium-sized clinics are being strategically placed and structured to support populations and help patients move toward healthier lifestyles. Today, facilities must support impactful care that keeps patients out of hospitals and gets them healthy as quickly as possible. View our brochure to see how these elements work in concert. Healthcare construction is now about retooling spaces to focus energy on core care elements. Every design element must be deliberate, thought out and justified by a functional purpose. Design decisions take into account the return on investment (ROI) and value they deliver, not just aesthetics. In other words, design must blend seamlessly into construction to solve business problems. Every aspect of your build should support treatment functions, care efficiencies and positive experiences for staff, patients and families. Core aspects of supporting these functions include the facility master plan and the healthcare floor plan, among others. The master plan is a comprehensive document and architectural drawing that outlines precisely what builders will construct both initially and in the future. It outlines space allocation and usage, provides a blueprint for facility expansion and incorporates statistical trends while also defining the goals and long-term development of a facility. The latest medical research studies have confirmed what so many of us have already experienced — the environments around us matter. Specifically, research has shown that care environments directly affect patient outcomes. And today, healthcare facilities are all about evidence-based design, which uses research-based principles to influence design decisions. Processes have been improved, flow has been studied, overall patient experience has been thoroughly examined. Today, building successful hospitals, urgent care clinics and health clinics means incorporating an evidence-based design vision from the start of a project. And that means improving the quality of care and quality of patient experiences. Many owners and communities rely on their healthcare facilities to remain useful for a long, long time — we’ve built healthcare facilities designed to last for 50 years. Setting expectations and developing solutions for a healthcare facility’s useful lifecycle is a core aspect of any healthcare construction project. Achieving success with a long-term build demands intentional planning and thorough exploration of not only a long-term vision, but also long-term design, material and construction solutions. A facility must be able to accommodate change, expansion, tenant movements and redevelopment of the overall structure. And interior design must look good decades after the ribbon cutting. One approach to consider is modular design. It involves planning a facility to incorporate flexibility into space allocation, room design and other elements so the facility can adapt to change. It becomes organic in its own sense, adapting to the lifespan and needs of its users — without major facelifts or costly renovations that force owners to suspend or limit business operations. We also take the approach of specifying cost-effective building materials that last — highly durable solutions that accommodate change. No project is complete without taking steps to achieve a best-value build. At The Korte Company, we believe innovation and collaboration are the keys to getting the best bang for your buck. We use a unique Design-Build process unlike any in the industry to deliver the strongest design and construction solutions. In this approach, we build a team specific to your project, inviting all key stakeholders, specialty contractors and construction professionals to identify value-added solutions at the onset of your project. This includes a thorough Life Cycle Cost Analysis, in which we evaluate the long-term benefits of different solutions. And it extends far beyond pure dollars and cents, ensuring every element of design, construction and overall project delivery support your project goals and core vision. The process of evaluating best-value solutions and achieving best value encompasses green solutions. After all, sustainability pays off. Building smart with sustainable design and efficient construction paves the way for savings, sustainability and long-term value. And in our experience, many projects can meet LEED Certification with little to no up-front cost impact. We believe that by building smart, we can truly make the world a healthier place to live. We’re proud of that mission. And we live it every day. Our healthcare Design-Build approach is based on current medical building research and offers a holistic response that promotes the healing process through integrated and innovative technology and patient wellbeing. From healing gardens to high-tech research labs, our diverse range of healthcare construction expertise has helped solidify our position as a leader in medical facility and hospital construction. Whether you’re hiring us for healthcare facilities planning, evidence-based design or integrated healthcare Design-Build, we find the smartest way to get the job done. To see how we can help your healthcare facilities thrive over time, see our in-depth guide to the building program of Anderson Hospital. Or, to get a broad sample of our work, browse through our many healthcare construction projects. We’ve published an extensive guide walking you through the process of managing a successful healthcare construction project. In it, we highlight the 14 steps of an efficient build and show you how to realize the best value from your next project. Fill out the form below to download the guide. Healthcare construction and design require specialized skills. Experience is critical, especially when construction decisions affect patient outcomes. In this guide, we show you how to work most effectively with your builder as you manage healthcare facility construction, expansion or renovation from start to finish.